Diary of a Sewing Fanatic: Are you ready for the next pattern giveaway from Closet Case Files? Are you ready for the next pattern giveaway from Closet Case Files? For this pattern giveaway you have to decide do you want comfy-ness at home or out in the streets? Because...Heather is offering the chance to win either a pdf copy of "The Carolyn Pajamas" or "The Morgan Jeans." Seriously y'all I told you that the pattern makers came through with a fierceness! Personally what I like so much about Heather's patterns is that she's named them for people I either know or know of AND they fulfill a need in a woman's wardrobe. As women aren't we always on a quest to find the perfect fitting pair of jeans or a bathing suit that accents your real body parts, yet allows you to have a good time at the beach or the pool, without feeling a need to cover up! Hey Heather even brought back a personal favorite of mine from the 70s, the bodysuit in the Nettie pattern. Now while I have a personal policy NOT to try to look like my 20 year old self again, it is thrilling to see younger women experience a trend that I loved and lived in. The internet is full of amazing images of women of all shapes and sizes, colors and ages wearing me-made garments from Closet Case File patterns. So if you've always wanted to own either the Carolyn Pajamas or the Morgan Jeans, leave a comment below and tell me...are you comfy at home or out in the streets?! Since the giveaway is for a pdf pattern, it's open to everyone in the sewing universe who'd like to win one. Please make sure that you sign your comment with your name if you are logged into blogger as unknown. No name and your entry will be voided. This giveaway is open until Wednesday, September 14th at 11:59pm EST. The winner will be announced on Saturday, September 17th. So let me know, comfy at home or casual in the streets?!!! BTW, we have only one more pattern giveaway this month...so stay tuned for more Happy National Sewing Month goodness! I would love to wear the Morgan jeans out and about! It would be great to wear jeans with a more relaxed fit, that's for sure! I'd love that Morgan pattern. I just got some Cone denim to make some jeans. Thank you! Nettie is a personal favourite <3 although i love fitted garments, when at home i'm all about comfy (basicly home= pjs �� )so, i have to say Carolyn! I would love to make the Morgan jeans. I've been starting to sew for casual wear rather than just work wear recently, and these would be a great addition to my pattern and then clothes wardrobe. I have both patterns but have not sewn either yet. I have made several pairs of her Ginger jeans. I just want to say congratulations to the winner because I have never seen instructions as good and complete as Heather's. I think she is a genius. This is a great giveaway. Oh, definitely casual in the streets!!! Pick me!!! Ooh the Carolyn pajamas, they would take my sleepwear to a new (classier) level. I own the Carolyn pajamas, so out on the streets for me! I would love to win the Carolyn pyjamas - I've been eyeing them for ages and this would be the push I need to finally tackle that collar. Ohhh, i would love to make the Morgan jeans. I've got this cool denium fabric with lightly painted gold flowers, just a slight shimmer. Comfortable and casual on the streets. Morgan jeans please! I would love to try the Carolyn pajamas. I don't always sew for comfort so these would be nice to try. With Autumn on the way my mind is on warmer sewing projects so I'd love to cosy up wearing the Carolyn PJ's. I'd be happy with either pattern, but if I had to choose, I'd go for the pj's; I've seen similar styles done as evening wear, and I'd love to give that a go! 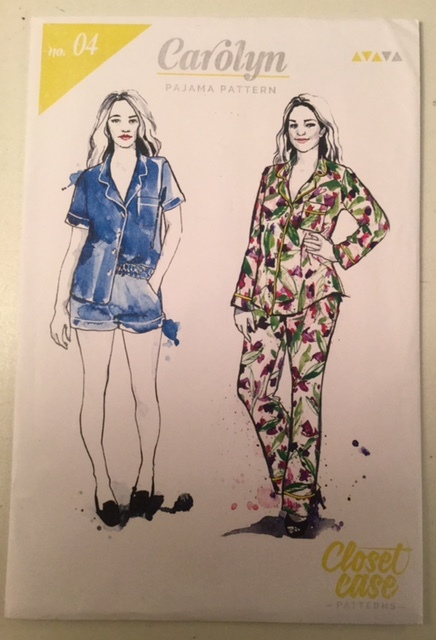 I love Pyjamas for the winter months and this pyjama pattern looks super comfortable. Morgan jeans would be a nice challenge and add to my wardrobe!! I'd love a chance to win a CCF pattern. Oooh - so hard to choose though since both patterns are tempting me. Probably the Carolyn pyjamas. I' 'd love the Morgsn boyfriend jeans (actually I own the Carolyn pyjamas) - time to challenge my Self with jeans sewing! I am definitely looking to be comfy out in the streets-I need to try the Morgan jeans. I have to admit that I did use her troubleshooting guide for summer shorts this year and it resulted in the best fitting shorts I have EVER made. I'd love to win this one but if I don't, I'll probably buy a kit next time she offers them, with the Cone denim. I'd like 'out in the streets'. My preference is the Morgan jeans. Thanks for the Give Aways! Thanks for the Give Aways! The comfortable pj's sound great. Thank you for the give away! Thanks for the giveaway! The PJs would be my choice. Both are on my to sew list. I've made 5 pairs of gingers and just downloaded the Clare coat. Since I've got the perfect fabric for pajamas I'll go with those the Carolyn's. Very keen on the Morgan jeans (long time reader, first time comment) Cheers, Jen. The Morgan jeans look amazing! I've had my eye on the Carolyn pj's and would love to have that pattern! I just love the idea of making the Carolyn pj's! The jeans! I would really appreciate the jeans. You have been very busy arranging all this - hoping it is as enjoyable for you as it is for us. Winter is coming so the Carolyn pj's would be wonderful. You are giving away some of the best patterns! I think my pick is going to be the jeans. I would love to try it out. Thanks for doing this! Definitely Morgan Jeans! I've never had a pair of jeans fit me and would love to try to make my own. Ohhhhhhhh, your National Sewing Month Celebration is becoming more and more exciting every day! I am completely in love with Closet Case File patterns! Please enter me in your contest! Casual in the streets! I'd love to try sewing my own jeans! I would love the Carolyn pajamas pattern. Every time I see a pair on IG I do a screen shot, marks in the piping and go ga-ga over all of the amazing prints. Then I click the hashtag and wish someone would just make them for me....ooh to dream, but if I won the pattern I could find my fancy fabric and colored piping and make my own. I love the Morgan jeans. I really want to make my own jeans since I'm doing a RTW fast. And I need new jeans for the winter. I'm a comfy at home girl. And I've actually had my eye on both patterns! But the PJs especially. I've learned a feel better about myself out and about if I try to look a little more pulled together. But at home, comfort is key. I want to be comfy at home. Picturing the pajamas in a warm flannel while drinking a nice red wine. Carolyn PJs, Carolyn! Thanks for the gives. Carolyn PJs for sure. I could use some comfy lounge pants for days I'm just home with the toddler! I'd love to try the Morgan jeans. I could use some more comfy in the streets; I like the Morgan Jeans. I've made pajamas before but not jeans. Thank you! I would love to make a pair of pajamas! Please enter me for the Carolyn pattern...and thanks for reminding me to get the Nettie! I love that bodysuit and need one (or several) in my life. I would love to win the Morgan pattern! Boyfriend jeans are high on my "must-have" list for sure. Thanks so much for organizing all these generous giveaways for National Sewing Month! I would like to be comfy at home! I'd love to be out & about in the Mogan jeans ! This has been an inspiring month of giveaways . It motivates me to keep sewing ! I need to get out more, so though I love both patterns, it's hitting the streets in some Morgan jeans for me! I love the fit of these jeans. Thank you for offering such a great giveaway, Carolyn! I'd love to try the Morgan jeans. I haven't tried making jeans since college and I think they were kind of a disaster. I like to be in comfy clothes all the time! I have several pieces of denim in my stash that I'm itching to try with jeans. The Morgan Jeans look great! I could use some fun new pajamas and the Carolyn pajamas look so cute. Casual in the streets for me, please. I am already making my second set of Carolyn PJs! Casual in the streets, for sure! But mostly I commented to say how much fun I'm having celebrating national sewing month on your blog! Casual in the streets! Thanks for the generous giveaways and for the inspiration! I would love to win the Jean pattern for lazy weekend days around the house. Morgan jeans for me please. Thanks for hosting this month of fun Carolyn. I really would like to make a pair of jeans that fit and from what I have seen on from all the blogs - Heather has nailed the fit for jeans for many body types. Also, I am a big fan for comfort loungewear/sleepwear and love the classic tailored look of Carolyn. I would love to win either of these patterns. The Morgan Jean!!! Yes yes!! I cross my fingers, thanks for this giveaway! I would love to try to sew the Morgan jeans. I just recently started seeing this pattern on lots of people online and it looks so good on them! Thank you for bringing Closet Case Files into my life. That coat pattern on her site is to die for. I've been really curious about the Morgan jeans. Thanks for organizing this. Morgan jeans....probably they would fit me....on the search for the holy grail of jeans patterns. I would love to try them ! Would love to try the Morgan Jeans pattern; they look both stylish and comfortable! I'd love to try the Morgan jeans - I pretty much live in casual clothes. Definitely out on the street, would love to try the Morgan jeans pattern. I would love the Morgan jeans pattern. I've already gotten my denim, thread, and zippers, but don't have the pattern yet. I'm all about comfort at home, so it's the pjs for me! I am in desperate need of good-fitting comfortable jeans! Toss my hat into the ring as well. I'm intrigued by the Morgan jeans since its been so long since I've worn loose fitting jeans. Plus I've been enjoying my Carolyn PJs since they came out. I would love the Morgan pattern, great give away! Comfy at home! For sure with the fall weather coming!! Comfy at home, been eyeing those Carolyn pajamas for a while too! I am definitely needing comfiness at home; so the pjs would be great! I've had my eye on the pj's. Thanks for offering the giveaway. I'd love to make the Morgan jeans. Like so many others, I've had my eye on the Morgan jeans. Thanks for the chance to win the pattern! Comfy out of the house - I've been eyeing the Morgan jeans for a while now. Oh I would love to make the Carolyn Pyjamas. These would be awesome for lounging around the house. Comfy yet stylish. Carolyn, such a hard decision, comfy clothes always. Jeans! Lately, I seem to love to be out in the streets. :) The Morgan jeans pattern looks so comfy and cool. Thanks for having this giveaway, Carolyn! Pajamas and comfort all the way! Comfort at home, pj's are my favourite clothing! I would love to try the Carolyn PJs. Mmm. I like to be comfy at home and out and about. I don't really wear pyjamas, though, so I'll opt for the Morgan jeans. Thanks. I would like to feel more comfy when I am out and about - so I'd love to try the Morgan jeans. I would love to try the Morgan jeans! Its so hard to find comfy jeans! I would love to win the Morgan jeans pattern, I've been eyeing it for a while. Thanks for the giveaways! The pajamas would be nice. Definitely comfy at home for me please. Comfy at home is my go to. Thank you so much! Beautiful patterns. I like very much the pajamas. Thank you so much! I love the ginger jeans, the fit is great and are really comfortable - I would love to win the Morgan jeans, thanks! Id love to win the pyjamas! Again thank you so much for your initiative with this give away. I am all for comfy at home! Thank you for this opportunity Carolyn! Morgan jeans!! Easy choice as I already own the Carolyn pajamas :) Thank you for the giveaway! Morgan jeans could be comfy at home or out on the streets! For me they'd likely make their debut at kindergarten pick up! Ooh, I've been wanting to try my hand at making my own jeans! I would LOVE to try my hand at jeans! Thanks for the chance to win. I have had my eye on the Morgan jeans. Love them. I am definately and indoors gal. With toddler germs and baby spit up - it's an embarrassment to step outside right now. Love those Carolyn pajamas. They look so comfy, like an adult version of pajamas from when I first learned to sew as a child over 45 years ago. The Morgan Jeans for me! Ooh what a lot of comments. I'd love the Morgan Jeans please. I need them and I think I'll make some linen ones for the summer. I definitely want to try the morgan jeans! I've been looking for a pair of boyfriend style jeans to embroider/make my own, but it would be so much better to make my own jeans and then embellish! I would love the Morgan jeans. Thank you for the giveaway! The Carolyn pajama pattern would be a perfect win for me! I spend most of my time at home due to illness, so I would live in them! I'm feeling hopeful about getting jean fitting worked out, so I'm going for the Morgans. I would love the Carolyn pajamas. Comfort is my go to! I would love the Carolyn pajamas. I would love to make a pair of jeans! TY!